Deciding on linear or connecting system most suitable in a particular situation could be time consuming. With a wide range to choose from, making a decision involves comparing of the technical data. 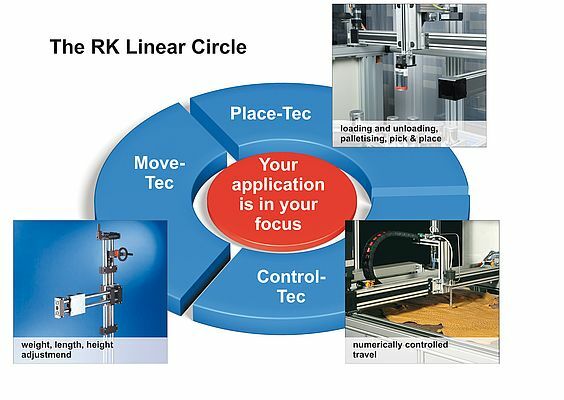 The “Linear Technology” and “Connecting Technology” selection aids from RK Rose+Krieger GmbH simplify the task of finding the right components and function modules. Also available online, the linear technology selection aid sorts products according to application and performance criteria, where as the connecting technology selection aid distinguishes between three segments according to load range. The linear technology selection aid filters the products under Move-Tec, Place-Tec and Control-Tec. Move-Tec contains products for occasional width, length or height adjustment with low duty cycle, low speed and average to high stability. Place-Tec is for loading and unloading, palletising and pick & place applications in 3-shift operation with short cycle times, high cycle rates and high demands on repeatability and reliability. Finally, Control-Tec is for numerically controlled positioning applications with uniform movement sequences in 3-shift operation, high drive stiffness and high demands on positioning accuracy. The next step is to distinguish between constant and variable overall lengths, and between guides with or without a drive. The fourth step selects on the basis of technical data. The “Pipe Connection Technology” selection aid distinguishes between three segments according tolow load (plastic connectors), medium-to-heavy load (aluminium connectors) and heavy load/impact-resistant (stainless steel connectors) ranges. The next selection steps involve choosing between one-piece or multi-part elements (advantage: retrofitting is possible) and between right-angled, axially parallel and articulated connections. The online version of the pipe-connection technology selection aid is being prepared.